The name Inner Fire Yoga is inspired by the powerful foundation of yoga philosophy called, “tapas”, which means “fiery discipline” or “internal flame”. It is fiercely focused, constant, passionate and represents an intense commitment to burn off impediments that block our true nature, leading to a state of mental peace, physical freedom and a compassionate heart. At Inner Fire Yoga this translates to challenging ourselves to be our best: consistency of yoga practice, kindness, humility, forgiveness, taking care of each other and our community. Our inner energy and fiery discipline evolves into an over arching quality of life rather than just physical effort. At Inner Fire Yoga we pledge to ignite your inner fire, inspiring you to reach higher and burn brighter. Step through our doors and discover a warm, cheerful refuge. Replace the noise of your busy world with the comfort of a safe, clean and healing environment. Our supportive community and expert instructors will encourage, guide and motivate you to achieve new heights of fitness in mind and body. Join us to create a life of balance, strength and inner peace. Inner Fire Yoga's mission is to deliver an authentic yoga experience. We offer hot, power, yin and sculpt yoga with the highest level of expertise and integrity. We inspire those who reach for excellence to achieve freedom in body, clarity of mind and generosity of heart. Inner Fire Yoga’s Owner and Director Marit Sathrum walked into her first yoga class at Bikram’s Yoga College of India in San Francisco, California in March 1993. Half way through the first exercise, pranayama breathing, she was hooked. Almost immediately, she participated in the 30 day yoga challenge and received countless benefits, including: quitting smoking, losing 17 pounds, gaining nearly an inch in height and feeling a sense of overall well being and self confidence. This was the beginning of a wonderful journey towards the creation of Inner Fire Yoga. In 1997, the clarity gained from a regular yoga practice led Marit to make a life changing decision: she quit her job as an equity analyst in the investment banking industry, and enrolled in a 500-hour teacher training program at Bikram’s Yoga College of India in Los Angeles. In August 2000, Marit’s son was born in San Francisco, California. Just over a year later, on the eve of 9/11, she and her son’s father parted ways. “It seemed as if the world was crashing down all around me. I took a close look at life, and decided to go back to my roots. I moved back to the Midwest to raise my son as a single mother.” While visiting Madison in June 2002 looking for a job and home, Marit saw a “For Lease” sign as she drove by what would become Inner Fire’s first location on University Avenue. Marit, with great faith, took a risky leap and borrowed money from several credit cards to open the doors of her first studio. Inner Fire Yoga opened its doors on Oct. 14, 2002 as Bikram Yoga Madison. In December 2005, even though her life was quite full between running a small business and being a single mother to a five year old boy, Marit had a deep longing for another child. Marit traveled to Ethiopia, Africa and adopted a five-month-old baby girl. The name Inner Fire Yoga was born in 2007 as as result of the desire to express passion for a wider variety of yoga offerings - not just Hot Yoga, but also Power Flow and Yin Yoga. To bridge what appeared to be a divide between Hot and Power Flow Yoga, Marit, with the help of several senior teachers, created the Inner Fire Flow Yoga sequence. In 2011, Inner Fire Yoga graduated its first class of newly credentialed 200 hour yoga teachers. 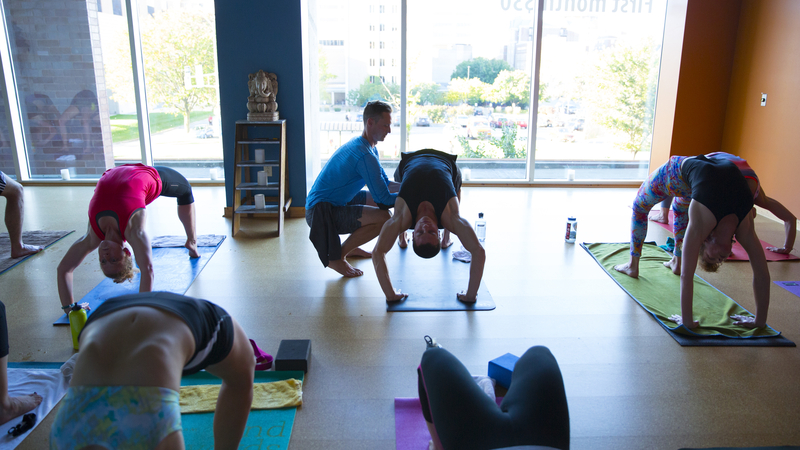 In 2013, Inner Fire Yoga opened its second studio location in the heart of UW Madison’s campus. 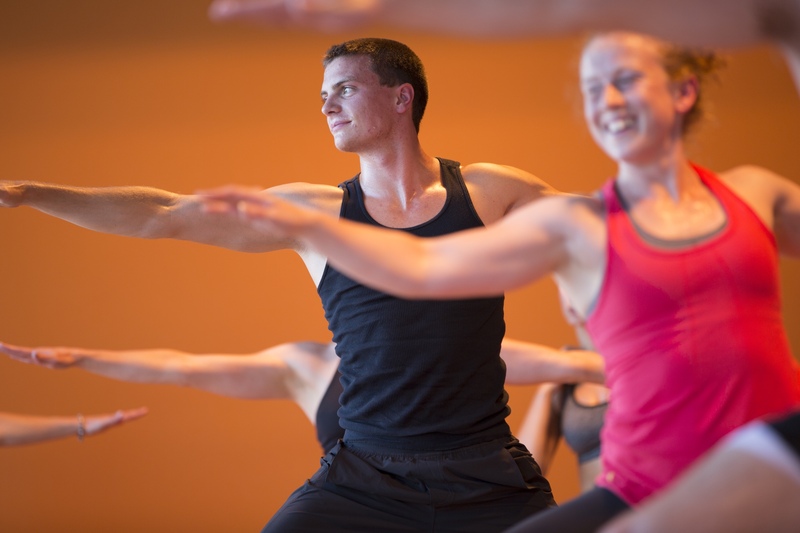 Inner Fire Yoga now offers regular and frequent Hot, Power Flow, Inner Fire Flow, Sculpt and Yin Yoga classes in two Madison locations, as well as a 200 hour yoga teacher certification through its Yoga Teacher Training program. Since day one Inner Fire Yoga has been committed to serving the Madison area community with an authentic yoga experience at the highest level of expertise and integrity, inspiring those who reach for excellence to achieve freedom in body, clarity of mind and generosity of heart. Hot Yoga is a series of 26 postures and 2 breathing exercises performed in a heated room. You will sweat and you will leave feeling great! This classical style hatha yoga class systematically works the entire body, stretching muscles, building foundational strength, detoxing internal organs, stimulating the glandular systems and challenging the cardiovascular system. This class is appropriate for beginners and more experienced students alike. It is truly a complete mind-body workout. Your focus will improve, your mind will become clear, your body will detox and you will feel as if you are floating out of class. A regular Hot practice can even reverse the effects of poor posture and chronic ailments. Ready to feel amazing and rejuvenated? Our heated Power yoga is for you. These classes feature teacher’s choice sequencing that gets you moving, breathing and sweating through challenging, yet invigorating flow yoga classes that heal, detoxify and electrify! Inspiring music helps create the complete power flow experience that will improve flexibility, as well as sculpt, hone and tone the muscles of your body and your mind. Power classes may include several vinyasa flows, spinal twisting, longer holds for maximum strength, focused abdominal work, inversions and arm balances. Keen focus, concentration, control of breath and determination are required – a willingness to reach higher and burn brighter! To attend an Intermediate-level class, a regular and established power flow yoga practice is required. This class blends the best of both worlds: a moderately paced vinyasa flow with some longer holds and plenty of heat! Inner Fire Flow is a sequenced class — meaning it is always the same order of poses — which combines many of the foundational classic yoga poses found in a Hot yoga class with well known Power Flow sequences. Because it is the same sequence every time, it enables practitioners to let go of external focus, calm the mind and experience the moment to its fullest, connecting being with breath. It’s a graceful, fun and challenging class that includes music. An Inner Fire Flow class will leave you feeling strong, energized, cleansed and centered. This class is offered in both a 60-minute sequence and a 75-minute sequence. Slow is a mindful, slowly paced yoga class that incorporates conscious flowing of breath with movement of body. This class is appropriate for beginners and experienced practitioners alike. The challenge in the class is from awareness of movement that is slow and focused. Therefore, this class can be a welcome change for students who like a fast-flowing, more intermediate-level class as well. This class will build strength through slow, focused movements, will detoxify cells through breathing and sweating in the warm room, will increase flexibility and range of motion via flowing movements and deep stretching. It includes focused and gentle opening of the body and spine, foundational yoga poses and sun salutations, attention to detail on breath and alignment and some longer holds for strength. Keen focus, concentration, control of breath and determination are cultivated in Slow, plus a willingness to reach higher and burn brighter! In this all-levels meticulously paced class, you’ll focus on strength, flexibility and relaxation. We light candles and provide a serene atmosphere and precise, attentive instruction. You roll out your mat, let your day slip away and ease into the evening. In Candlelight Flow, you can expect to build muscle, lengthen your whole body and enjoy the meditative qualities of nighttime yoga. Inspire your practice and ignite your spirit. Yin yoga works deeply into muscles and connective tissues through extended holds of grounded postures. These one-hour classes are great for those looking to restore flexibility and/or work deeply into joints and tissues that are “locked up” from past injuries or from repetitive motion. Yin yoga specifically targets the hips, pelvis and lower spine. The challenge from this class comes from staying deeply in a stretch for an extended period of time – by going beyond the point of wanting to “give up”. The focus is less on strength building and more on restoration, de-stressing and relaxation. For many students, this class is one of the most challenging, yet totally relaxing experiences they have. Sculpt blends power yoga with resistance training, so it offers the zen of a yoga practice and the calorie burn of a high-intensity fitness class. Plus, it’s fun. Set to energizing music, this class will boost your metabolism as you tone and sculpt every major muscle group and improve flexibility. In short, it’s yoga awesomeness! Gentle is a deeply therapeutic, slow-paced and mindful yoga class, appropriate for beginners and experienced practitioners alike. Classes will focus on winding down and releasing tension at the end of the day with mostly seated and reclined postures and longer holds. These classes might also incorporate some standing poses, yin poses, and meditation, leaving students feeling balanced, rejuvenated, and relaxed. FIT Yoga com­bines the transformative powers of hot yoga and HIIT (High-Intensity Interval Training). With fun and motivational music, this dynamic class will strengthen your entire body, keep your heart rate up, burn fat and boost your metabolism. Within a few classes, you will experience the benefits of increased strength, flexibility and stress reduction. FIT Yoga is safe for all levels and is for EVERYONE who is looking to ignite their inner fire, get fit fast and feel amazing! "The benefits I have gained from a regular practice have been abundant and my life has changed for the better in ways I could not have imagined. I love practicing yoga, not only for the physical workout, but also the spiritual aspect. When I practice for an hour a day, I feel like I can truly breathe and let go. All of the teachers at Inner Fire Yoga create a safe and welcoming environment where mistakes are accepted." "My first Hot Yoga and Power Flow classes were beyond challenging… However, with the help of the fantastic instructors at the Inner Fire Yoga, I realized that yoga was unquestionably the thing for me; In addition to improving my physical and mental well-being, I found a way to not let anyone or anything steal my peace. For that, I will be forever grateful." "A few months into my practice at Inner Fire Yoga, I greatly improved my postures in class, lost weight, gained strength, had greater flexibility, increased my energy, improved my digestion, and enhanced my performance in many other sports. This past winter, I went skiing with my kids, and I felt so felt balanced and quick on my feet. It all seemed effortless! Additionally, I went golfing and discovered I was so much better than I was before I began my yoga practice. My distance had improved (every golfer’s dream!) and my swings were effortless! Now if HOT yoga can improve my golf game, then I am a yogi for life (haha)!" "When it was over, drenched in sweat and completely emotionally spent, I asked my friend, "Why was this so different from other classes? I feel amazing!" She said, "Inner Fire is a studio with a soul!" She was right." "There are many layers to my yoga practice. Physically, I have worked through all kinds of aches and pains. My knees, which have been tweaky and tender for probably 20 years, are the happiest. They now feel strong from the inside out, and hardly ever talk to me. HOT yoga provides such an incredible base for my fitness: I can handle the altitude in Colorado when I visit my daughter and scramble all over the mountains with a full pack, can canoe all day on the Kickapoo river, rollerblade my heart out whenever I feel like it, and carry five bags of groceries up the stairs to our apartment without batting an eye. I am stronger and more fit than I have ever been." "I am beyond grateful for the teachers at Inner Fire Yoga that have guided me, helped me clear my mind and embrace the present moment. Each teacher at Inner Fire Yoga has touched my heart in a unique way and inspired me to continue on this beautiful journey that began with one single step onto a mat." One of the main aspects I love about yoga is the sense of accomplishment after completing a class, learning a new pose, or balancing in half moon without falling on my neighbor. Some of these yoga moves can be pretty intense, and you feel so proud when you find yourself being able to do something you never could before. I think Inner Fire provides a good balance by encouraging you to "reach higher, burn brighter," but if you're not feelin' so high 'n' bright today, that's cool too. No one's going to judge you. Your practice is your own, and you are the only judge of your progress. Before finding Inner Fire Yoga, I would practice yoga here and there, but never with the dedication that I do now. It was the heat, the tight-knit community and the welcoming teachers at Inner Fire that inspired me to stick with yoga as a daily practice. During my first class at Inner Fire, I knew I was hooked. Since then, it has certainly changed my life. I instantly began to feel the positive effects of yoga as soon as I began practicing. I quickly found increased flexibility, better balance and stress relief. However, the greatest benefits have taken more time. It has been a gradual process, but yoga has given me the gift of high self-confidence and increased mental clarity.